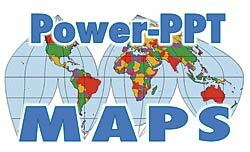 If you cannot find a Mountain High Maps for a PowerPoint® Presentation to meet your needs from our map catalog, please click here to go to the online quote form. We will respond to you promptly and quote you a competitive price for the map you specify. You should also check our other products; most images are individually downloable. The link below takes to a catalog of all our professional graphics products: GlobeShots®, a resource containing detailed colorized globe views; Frontiers™, outline maps detailing numerous geopolitical features such as coastlines, borders, cities, rivers, latitude and longitude, and more. Two other featured products, EarthShots® and CoolMaps®, are stock and clip-art image collections derived from Mountain High Maps®.